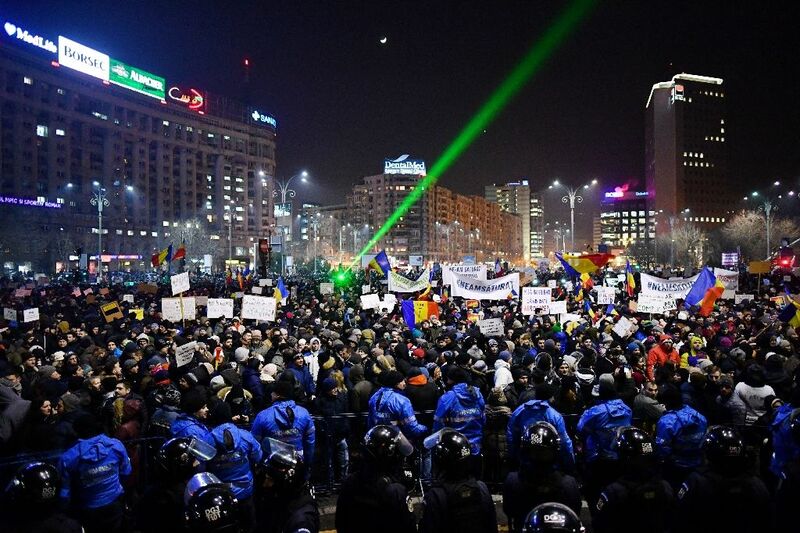 Bucharest (AFP) - Romanians protested in huge numbers this week against government decrees that many fear will undermine the long battle against an insidious phenomenon that has long plagued the EU country: corruption. 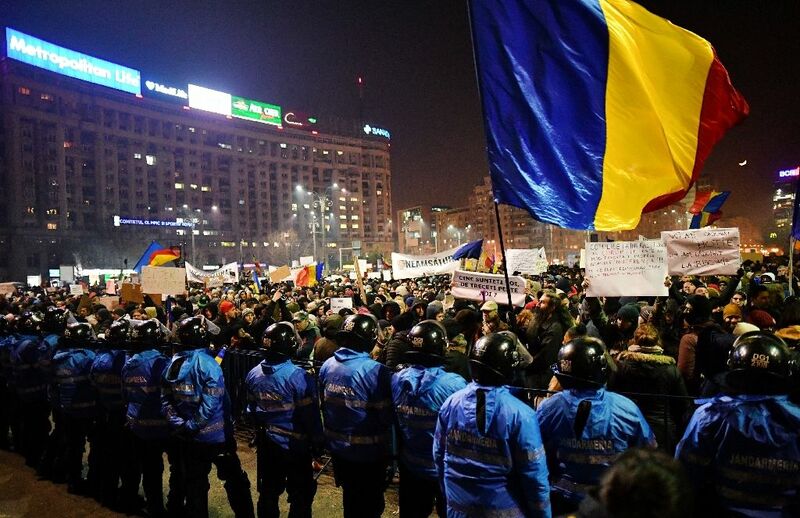 The biggest demonstrations since the fall of communist dictator Nicolae Ceausescu in 1989 saw as many as 300,000 people hit the streets overnight Wednesday to Thursday in the capital Bucharest and other cities. This followed the issuing of a government decree 24 hours earlier that decriminalises certain corruption offences and makes abuse of power punishable by jail only if the sums involved exceed 44,000 euros ($47,500). 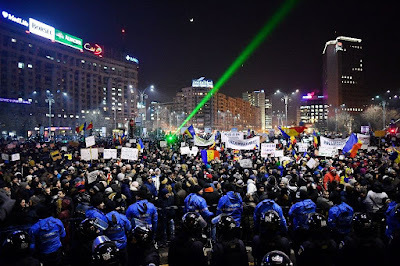 The European Union has long taken Romania to task over slow progress dealing with corruption and organised crime since the ex-communist country joined the bloc together with Bulgaria in 2007. Brussels has carried out what is known as a Cooperation and Verification Mechanism (CVM) review on both countries even though both have chafed at the procedure, feeling they are being unfairly targeted. Graft watchdog Transparency International ranked Romania below all but three of its fellow EU states in a January report based on public perception of the prevalence of corruption. Worldwide, the country ranked 57th in the world. Between 2014 and 2016, 1,171 people were found guilty of abuses of power which collectively earned them a fine surpassing a billion euros ($1.1 billion). More than 2,000 cases remain open. 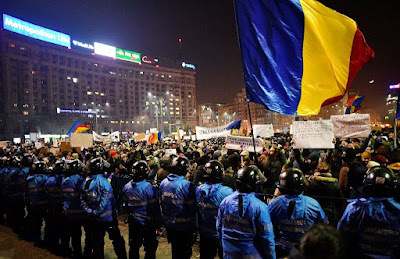 A total of 27 officials, including former prime minister Victor Ponta, have faced justice in Romania in 2015, a national record. Aside from Ponta, five ministers, 16 lawmakers and five senators faced trials. Former social democratic prime minister Adrian Nastase is the most eye-catching case of a former high-ranking official to be found guilty. He received two jail terms on two counts of corruption, marking a turning point in the anti-graft fight. Nastase was found guilty of misusing 1.5 million euros of funds for an unsuccessful 2004 presidential campaign and attempted suicide in a bid to avoid jail. Released in the first instance in 2013, he was again placed behind bars in early 2014 for receiving bribes totalling 630,000 euros before being released seven months later. Ponta stands accused of graft on two counts, the more recent linked to campaign financing which saw him take office in 2012. Ponta is accused of soliciting financial aid from a businessman to cover the costs of a trip to Bucharest by a "foreign political personality" -- in the shape of former British leader Tony Blair. In exchange the businessman, who said he stumped up 220,000 euros to promote the trip, would receive a seat in parliament. In another case, in 2015, Ponta was accused on 17 counts including forgery and complicity in tax evasion as well as money laundering between 2007-2011, when he was working as a lawyer.